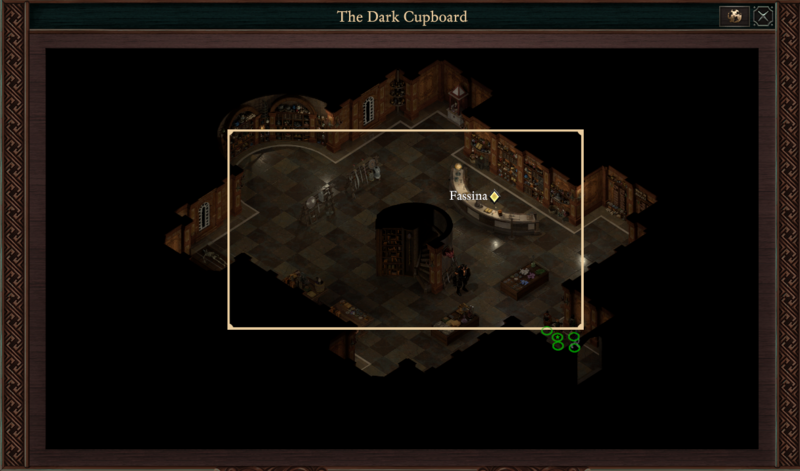 The Dark Cupboard is a location in Pillars of Eternity 2. The Dark Cupboard is a magic shop belonging to Arkemyr. Here you can fing a large assortment of magical equipment: unique weapons, grimoires, scrolls, potions, ingredients. Ironclad constructs serve here as guards, and imps are advertising agents, staying at each corner of Periki's Overlook and inviting everyone to visit the shop. Fassina, Arkemyr's apprentice and shop clerk will join your party as a Sidekick after the successful resolution of Velvet Glove, Brass Fist quest. After that her position will be taken by Shop Imp, who will handle trade transactions.